Gardeners who want to reduce pesticide use (all of us, right?) would do well to learn the science and art of conservation biological control. Enhancing habitat while simultaneously eliminating or reducing pesticide use encourages natural enemies of pests to take up residence in the garden, settle in, and reproduce. As populations of predatory and parasitic insects and other garden allies grow, pest species are less of a problem, further reducing the temptation to reach for pesticides. This positive feedback loop is integral to the success of this pest management strategy. Many gardeners are becoming accustomed to growing flowers to attract pollinators and beneficial insects such as lady beetles and lacewings; however, many natural enemies are not drawn to blossoms and require a different habitat strategy. Most common predaceous ground beetles (family Carabidae) are true carnivores, hunting caterpillars, beetle grubs, grasshoppers, and other small animals such as snails and slugs. Ground beetles, while common in most gardens, are rarely noticed because of their mostly nocturnal habit, dark color, and quick movements. Some ground beetle species may climb plants in search of prey, but only visit flowers if they happen across one while in pursuit of dinner. Provide dark, damp and sheltered habitat in your garden to encourage a beneficial ground beetle population. Beetle banks—wide raised swaths of perennial bunch grasses and flowering plants—first appeared on farms in England as a project of the Game Conservancy Trust. Located between rows of field crops, these plantings provide habitat for predaceous beetles and other wildlife. In a garden setting, generous mounded perennial plantings, or “beetle bumps,” are sufficient. Raised beds keep ground-dwelling beneficial insects like ground beetles, beneficial spiders, rove beetles, and overwintering lady beetles dry in winter while plant cover keeps temperatures even. Leaf mulch harbors many species of ground-dwelling beneficial insects including carabids, and compost heaps are a preferred hunting ground for carnivorous beetles. Large stones and logs set strategically in borders also provide valuable habitat for many garden allies while early-blooming grasses provide pollen for a slew of other beneficial insects. Carabidae is one of the largest families of beetles, along with the weevil and rove beetle families. Most species are nocturnal predators who emerge from their hiding places at dusk to swiftly run down their prey. Ground beetles have streamlined, somewhat flattened bodies with long legs that help them move quickly and distinguish them from the similar-appearing common darkling beetles. Many species of Calosoma are common and may even be found climbing trees in search of prey. The snail-hunting Scaphinotus, with their long narrow head and thorax for reaching into snail shells, are especially helpful garden allies. Species of Calathus, Pterostichus, and Laemostenus are all common garden genera. Other interesting species of ground beetles are more often encountered in the wild than in gardens. When threatened, bombardier beetles aim and forcefully eject a stream of boiling, noxious liquid that vaporizes with an audible “pop” as it contacts air. Many species of carabids share the ability to repel their enemies by releasing noxious fluids, but none with the spectacular show of the bombardier beetle! Beautifully marked tiger beetles, which often hunt during the day, are found along sandy riverbanks and other arid areas. Viewing the critically endangered Delta green ground beetle (Elaphrus viridis) requires a journey to Solano County, California, where it can be seen at the margins of vernal pools on the Jepson Prairie Preserve. Not all carabids are carnivorous. Seed-eating ground beetles are small, copper-colored ovals (or less often black or brown), and are sometimes spotted under pots or rocks and quickly dart about when hit with a flash of sunlight. Unlike herbivorous beetles that nibble on leaves and stems, the seed-eating ground beetle is more properly considered a predator, as it kills an entire organism each time it destroys a seed. I have not found seed-eating ground beetles to cause a problem in my garden, and enjoy watching them scurry about when suddenly exposed to light. As dusk falls in the evening, I am delighted to know that the vast family of carabid beetles is emerging for the nightly hunt. 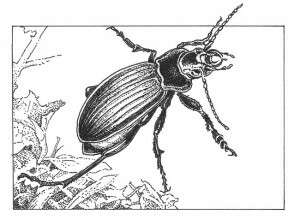 Popular Name: Ground beetles, predaceous ground beetle, carabids. Scientific Name: Order Coleoptera, Family Carabidae. Common Garden Species: Snail eater (Scaphinotus spp), seed eating ground beetle (Amara spp), rufous carabid (Calathus ruficollis). 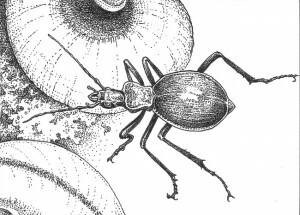 Many other genera, such as Calosoma and Pterostichus include common species of ground beetles. Distribution: Over 40,000 species world-wide; over 2,000 species in the USA, and over 800 in California alone. Life Cycle: Holometabolous (complete metamorphosis): egg, grub, pupa, and adult. Larvae have three instars (molt their exoskeleton three times) before entering the pupal stage. Appearance: Size ranges widely; most are between 1/8 inch and 1 1/4 inch. All beetles have chewing mouthparts, and like most other beetles, the elytra (forewings) are hardened. The thorax is narrower than the abdomen; snail feeding carabids have an exceptionally long, narrow head and thorax. Often shiny; they are usually dark colored, often black, but may be brown or reddish. Some are iridescent and brightly colored, especially green or purple shades. The subfamily Cicindellinae (tiger beetles), may sport metallic colors and spots of various colors, but these are rarely garden residents. Many species are flightless. 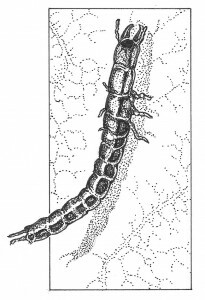 Larvae have 10 abdominal segments and large heads with visible mandibles; the abdomen tapers to two cerci (terminal sensory appendages). Carabids have long legs and can run fast; a good field characteristic to distinguish them from the often similar appearing darkling beetles (Tenebrionidae). Herbivorous darkling beetles are slower moving and rounder; they also have antennae that are enlarged at the ends, while ground beetles have thread-like antennae. Diet: Most predaceous in both grub and adult stage; a few eat seeds and decomposing organic materials. Both grubs and adults primarily feed on insects and other invertebrates in soil and leaf litter. Some carabids feed on snails, slugs and other invertebrates. Fiery searchers, aka caterpillar hunter, will sometimes climb trees and shrubs in search of caterpillars. Life Span: Varies. Beetle grubs may take a year to develop; adults may live 2-3 years. Favorite Plants: Carabids often shelter at the base of perennial bunch grasses and low-growing ground covers; many can also be found in leaf litter. In addition to grasses, beetle banks may include other plants such as buckwheat, cilantro, bachelor buttons, and other plants attractive to a variety of beneficial insects. Benefits: Often abundant in gardens, especially if suitable habitat is provided. Voracious, and may eat their weight in pests on a daily basis. May provide significant biological control, but the science is sparse. Some seed eating carabids may be useful in controlling weed species. Problems: A few species may eat plants (seed eaters); in the larval stage, a few species eat roots. Interesting Facts: Bombardier beetles are found in two taxa, the Paussinae and the Brachininae. In these beetles, two reactive chemicals (hydroquinone and hydrogen peroxide) are produced by the beetle and stored in separate chambers in the tip of the abdomen. When threatened, the beetle is able to mix these chemicals in a special chamber and with an audible ‘pop’, forcibly eject the resulting boiling hot gas. Many other carabids can produce noxious secretions to deter predators. Sources: Carabid species are primarily nocturnal. To attract a diversity of beetles to gardens, include a diverse array of plant species, which will attract beetle prey, and provide shelter. For shelter, in addition to plants listed above, include rocks, stepping stones, potted plants, and a few logs and branches. Bombardier beetles: Check out this remarkable You Tube video.